Corrugated Week 2018 (http://corrugatedweek.org/), is TAPPI’s annual corrugated conference and exhibit featuring over 140 exhibitors. This comprehensive event, which is co-produced by TAPPI and AICC, will assemble the largest gathering of decision makers in the corrugated industry in 2018. The program addresses the most critical issues facing the industry through expert speakers, panel discussions and technical workshops. You will be able to see new and innovative developments from Proton Products and get tips and ideas to help your company succeed. Proton Products are exhibiting on Booth 744 where there be a live demonstration of the InteliSENS® SL/SLR mini SERIES non-contact laser Doppler Speed and length measurement sensor. This revolutionary sensor is the smallest fully-featured non-contact laser Doppler speed and length sensor on the market with a foot print comparable to a smartphone. 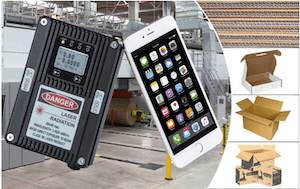 These sensors are designed to replace cumbersome, inaccurate, high-wear speed and length measurement devices with a laser Doppler gauge whose accuracy is better than ±0.05%. The InteliSENS SL/SLR mini SERIES provides speed and length measurement on the double facer and can send a precise board length contact output to the rotary shear to reduce waste from varying board dimensions for the box plant slotters and printers.